With some much to consider about a front door lock replacement, these eight points only scratch the service. Each section is meant to get you thinking more deeply about what you need to do in order to properly replace your front door lock. For the best security, and to find the lock that will fit your needs, be sure to read over the most important insights and options for front door lock replacement. With so many options and considerations for front door lock replacement, the first thing that you absolutely must do is know the bare essentials for door security. To start, a front door must always have at least one deadbolt. There are many types of door locks used in residential homes, but the deadbolt is the most important lock on a front door. A deadbolt is a lock that provides the door with actual security, as opposed to the door handle lock, which uses a spring-loaded latch that does not extend deep into the door frame and can be bypassed with a credit card. A keyed door handle can benefit your home’s security, but if it is the linchpin of your protection, then it is wrong for front door lock replacement. Be sure that your replacement locks are intended for use on exterior doors. For example, the type of interior locks you would use on a bathroom door is not fit for front door lock replacement. The front door is the most likely area of the home to be targeted by a criminal when attempting to gain entry, so you need solid exterior door locks for your front door lock replacement. Though it may seem like an odd question, you need to honestly ask yourself, “How safe do I want to be?” Realistically, the answer to this question should not be, “As safe as possible”. The best answer is, “As safe as practical”. And finding the answer to what level of security is practical comes down to conducting a proper security assessment on your home. When you conduct a front door lock replacement, the basic things to keep in mind for security are the features of your deadbolt. Chief among those concerns should be the amount of force that can be applied to the lock before the deadbolt fails. This will be the most likely attack perpetrated by a home invader or burglar. Lock pick resistance is also important, but more as a way to prevent lock bumping, because criminals do not pick locks. There is no way around the fact that all locks can be picked, and it is even truer that every lock can be broken open, given enough time and resources. That is why it is important to take other steps to burglar proof your doors, beyond choosing the locks you purchase your front door lock replacement. However, it is important to start with a solid foundation of security for your front door, and that is where you door lock comes in. Due to the growing number of front door lock replacement options, how you are going to be using your locks is very important. Think about the number of residents in the home. Consider how often the door will be opened and locked. If you plan to have a lot of company over for parties or a lot of people living in the home, a mortise lock may serve you better than a standard rim cylinder deadbolt. All locks wear out, given enough time and use. But certain locks are easier to service and fix than others. Similarly, there are also ideal locks for when you anticipate high roommate turnover or have the need to give access and take it away quickly. In cases like these, smart lock installation might be the best solution for your front door lock replacement. Be sure that you consider the differences between smart locks and traditional locks so you know which will suit your needs more completely. Your locks can either be complementary to your lifestyle or a hassle, as part of your front door lock replacement, you should strive to make it the former. There is more to buying a quality lock than just picking up any old door lock in the lock section of Home Depot. The trick is to know the difference between lock brands you recognize and the best front door locks. The options for lock brands can mislead you with their claims of quality between grading information and lifetime warranties. Based on what you know about your anticipated daily use of the lock and the security you need from the device, your options for what product you will use for your front door lock replacement will begin shrinking. You then might have to consider the very slight differences between high-security lock brands. When your options are limited, it might seem like the field of potential products has narrowed, but it may have just gotten more difficult to tell the difference between such similar locks. Front door lock replacement is about more than just the name on the lock you are buying. Even the best lock manufacturers make products that take different threats into account or are manufactured for more niche purposes. Don’t let the brand you choose dictate your security. Let your security dictate the brand. As a result of the leaps and bounds technology has made in recent years, there are many different types of electronic locks on the market. Those intended for residential use still have several distinct characteristics to choose from. For example, even with remotely accessible smart locks, there is still a tremendous functional difference between a Wi-Fi smart lock and a Bluetooth smart lock. In appearance, both Wi-Fi and Bluetooth protocols allow locks to be controlled by your smartphone, but the difference between the two is gigantic. Wi-Fi enabled locks can be controlled from anywhere in the world, whereas Bluetooth is based on the proximity between communicating devices. And that type of remote use might be something that you are not interested in, which is why you would not want to pay for something with those features. In terms of rental properties, one of the most popular electronic options for front door lock replacement are keypad door locks because they allow for ease of entry, combination changes are often simple, and there is no need for the property owner to make extra keys. It removes a lot of hassle when there is constant tenant turnover, and combinations are easier to keep track of than physical keys. But this same convenience may be a detriment to the security of the people living in the property. Front door lock replacement means buying a new lock. You need a brand new lock to replace your current security, and that comes at a price. As replacement parts are the most costly aspect of security changes, you might be looking to save money on your new lock. Saving money is possible if you understand how the price of a lock affects a lock’s security. The most important thing to avoid when buying locks is seeing the purchase as an investment. That being said, it is possible to get a deal on quality locks, as long as you know where to buy door locks. Online retailers must have a reputable track record, as it may be difficult to tell if you have been given a flawed or faked lock. Your front door lock replacement is almost entirely dependent on the decisions you make while buying your new lock. Most often, a high cost for a lock is closely associated with the level of security or specialty of the device. Just be sure that when you pay more, the extra investment you make is going towards the parts of the lock that you need. Check that you are getting the build quality, materials, and design features you can’t go without for your front door lock replacement. There are many questions to ask before you replace a deadbolt lock, but perhaps the most important inquiry is whether or not front door lock replacement is even necessary. There are several instances where concerns that would be solved with replacing locks or rekeying locks. Rekeying is perfect when you would be changing locks to deny entry to those who once had access to the home. And the cost to rekey a lock will almost never be more expensive than a full front door lock replacement. So if you are changing locks because you think someone has a key who shouldn’t, rekeying can potentially solve this dilemma. 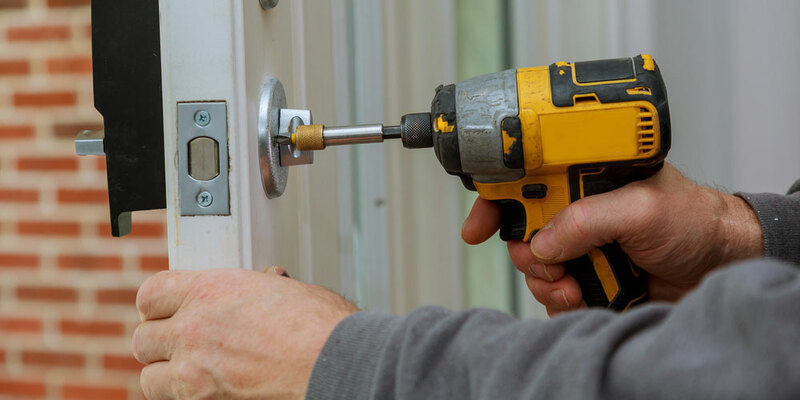 If there is something wrong with the front door lock, you may be able to fix the issue instead of undergoing a complete front door lock replacement. Of course, the broken lock may be more serious than you think, but there is still a chance that you can fix a jammed door lock or repair a stuck door latch if that is all that is wrong. These solutions can sometimes be cheaper than replacing everything, and when it is not cheaper, the answer is front door lock replacement. For more options and insights, a home locksmith with experience servicing residential buildings is the best resource possible. Besides the information that a locksmith can give you, they can also handle any work that you need to be done. Whether you do need to change your locks or rekey your locks, a residential locksmith is going to be the best choice. There is a chance that you can handle your front door lock replacement yourself, but there are situations where it might be better to hire a professional rather than upgrade your security yourself. When you call a locksmith you can also find out more about available locks and can purchase your new locks through the locksmith. A locksmith is your one-stop destination for everything you need to replace your front door lock. With all the options and insights to sort through, it may make more sense to have a trained and experienced set of eyes to oversee the whole process. You don’t have to undermine your own abilities to acknowledge the value of having a security expert handle your front door lock replacement. If you need help, there is no better assistance than a residential locksmith. With some much to think about, it would seem that front door lock replacement is too overwhelming. To simplify the points above, I would say that you need to find out what you want in a lock in terms of security and convenience. Once you know what you need, just be sure that is what you are buying. If you do feel overwhelmed, a locksmith can always help.